This picture was taken this morning when the paint on the 182's tail letters was still tacky. I just received this photo from Kalvin, the other pilot in N'Djamena. Pictures like this get me excited to get to Chad to start using the tools of mission aviation as we serve God's servants. 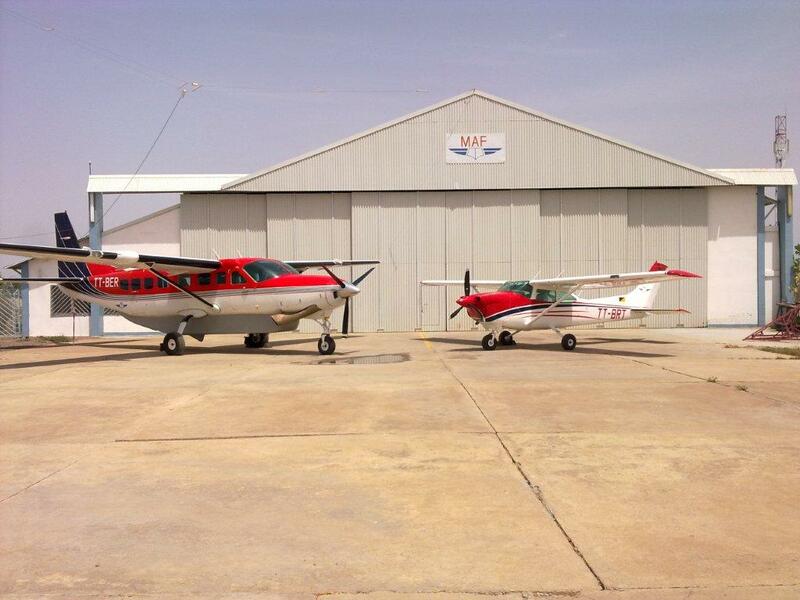 On the left is the the Cessna Caravan (TT-BER) that has been the backbone of the Chad program for the last several years. 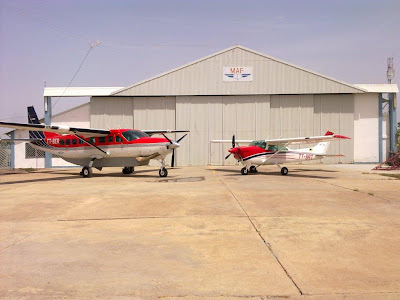 On the right is the brand new Cessna 182 Diesel with it's new Chadian registration: TT-BRT. I think Bert should do for a name. Although it is relatively small compared to it's hangar mate (4 seats as opposed to 14), the 182's key feature is the diesel engine which burns Jet fuel rather than AvGas. AvGas has become increasingly expensive and in some places, impossible to acquire. I heard that in Congo the price for AvGas had reached $16/gallon. For us Canadians that is about $4/liter. Our Cessna 182 aircraft are modified with an SMA (SR305-230) turbo-charged engine which burns Jet A1 fuel. This is crucial as the scarcity and skyrocketing cost of Avgas have endangered the continued use of our Cessna 206 aircraft. The 182 SMA carries up to three passengers with a cruising speed of around 120 knots. Although it is smaller than the 206, it has a greater range - of up to eight hours.Turbo-charged, though acting like a normally-aspirated engine, it has excellent short take-off performance. We anticipate the modified 182 will be especially useful for medical emergency flights and for carrying a small number of passengers for multi-day trips to minister in the interior of countries with difficult terrain. This 182 has been trialled in our operation in the Democratic Republic of Congo in for its viability for service around the world. Potentially, we will be able to fly the 182 SMA at half the cost of the 206. As a result, it is now being rolled out into our operations in Chad (due March 2012) and Madagascar (due later 2012). With each operation currently having a fleet of just one Cessna Caravan, this will be a vital addition to meet the needs of our partners. How far can each of these go with full fuel tanks? Will all the flying be within Chad or will you sometimes fly outside of the country? The question of range really depends on how fast you want to go. You can go fast and burn lots of fuel but you won't get as far as if you slow down and burn less fuel. The Grand Caravan (big one) can go an average of 1100mi on a full tank of gas and the 182 can do about the same, actually a bit better – getting as far as 1300mi if you're really conserving fuel. The obvious difference is how much you can carry. Having both planes is great because we cover most of the types of needs in Chad. We also fly into CAR to the south when the need arises.